“Max’s” new bike, originally uploaded by BikeTinker. So far, it’s set up for me, while I “iron out the kinks.” This bike is really nice. I want to drop the levers a quarter inch, and run the cables higher on the bars, but it’s pretty well dialed. Dingle setup, 36×14 and 32×18. Flared drops. Flat pedals. I haven’t tried the low gear, but I bought a new ring just for it. Coasting is actually pretty fun! I like cassette hubs, and I like disc brakes. And threadless headsets. The two-tone bar wrap is also pleasing me a lot. You’ll see that again in a little bit. It’s a Gary Fisher Utopia hybrid my friend Jim (coincidentally a fan of CycloFiend’s bike gallery) gave me for my 10 year old. I thought (and Max still thinks), “Dude, it’s a grown-up bike!” But at 43cm, it’s the smallest 700c bike I can find, and the same size my LBS recommended for a kid’s first ‘full size’ bike. The only issue is getting the bars low enough, but a short stem, inverted, and the seat slammed all the way, puts the bars and saddle in the same relative position as his Redline Junior. I replaced the Metro shock with a rigid Kona Project 2 fork, and got some 42cm Salsa Woodchippers from a friend. 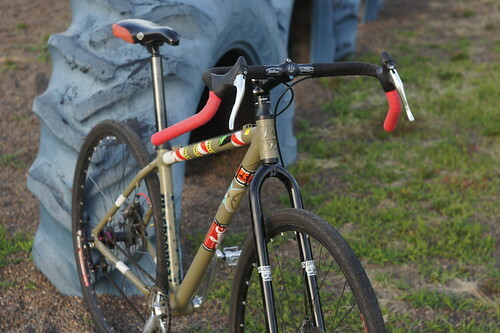 The bartape is Newbaum’s cloth tape, from Rivendell. So far the kid is sticking with the Redline Junior BMX bike he’s had since he was 5. That works for me, since I haven’t ridden another bike since I set up the bars. Stop me before I put a rack on it!